Abdoulaye Diallo of Casa Sport is one of my personal favourites in the Senegalese Ligue 1. Diallo is a modern centre-back with height, good heading and jumping ability. He tackles hard and uses his strength to stop opposing players. He is also a good passer of the ball and has the ball control to bring the ball out of the penalty area. Diallo can also play as a defensive midfielder. Diallo is born 21.10.1992. 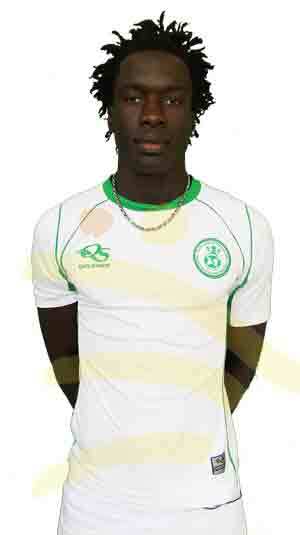 As far as I know, Diallo was only 16 years old when he made his debut in the Senegalese Ligue 1. A few days after his 17th birthday, Diallo played two Championship Final matches against ASC La Linguère. Unfortunately, Casa Sport lost on penalties. During the Ligue 1 2010, Diallo cemented his place in the starting eleven of Casa Sport. On 19.09.2010, Casa Sport won the “Coupe de la Ligue”, beating ASC Diaraf 2-1 in the final. Diallo starred in the heart of the defence. The Ligue 1 2010-2011 turned out to be the breakthrough season for Diallo. Diallo became a key defender for a strong Casa Sport team that eventually won the bronze medal in the league. On 24.09.2011, Casa Sport won the “Coupe du Sénégal”, beating Touré Kunda 1-0. Diallo was yet again found in the heart of the defence. Although the season 2011-2011 was wonderful, the following season, the Senegalese Ligue 1 2011-2012, turned out to be even better for Diallo. Diallo was dominant right from the start. In February and March 2012, Diallo gained experience from the CAF Confederation Cup, playing two matches for Casa Sport against Gamtel from Gambia. On 28.03.2012, Diallo scored his first ever goal at top level of Senegalese football. On 02.09.2012, Diallo wrote his name into the Senegalese football history, scoring the only goal of the match when Casa Sport won 1-0 against the Diambars Academy, securing their first ever championship title. After the Ligue 1 2011-2012, In December 2012, Diallo won the third place in the “Meilleur Footballeaur Local-award”, behind his teammate Aliou Coly (now Molde FK, Norway) and goalkeeper Ousmane Mané from the Senegal national football team and the Diambars Academy. The Ligue 1 2013 started with a bang for Diallo. On 15.01.2013, in an international friendly match against Chile, Diallo made his debut for the Lions of Teranga, the Senegal national football team. On 15.02.2013, Diallo was unlucky when he made his debut in the CAF Champions League, scoring an own-goal against Moghreb Tétouan in Morocco. Casa Sport lost 1-0 but still has a good chance to advance to the next round. The second leg will be played this weekend. The picture of Diallo was found on the excellent webpage www.ndamli.sn.